The 33-year-old left Salisbury District Hospital on Monday and has been taken to a secure location. 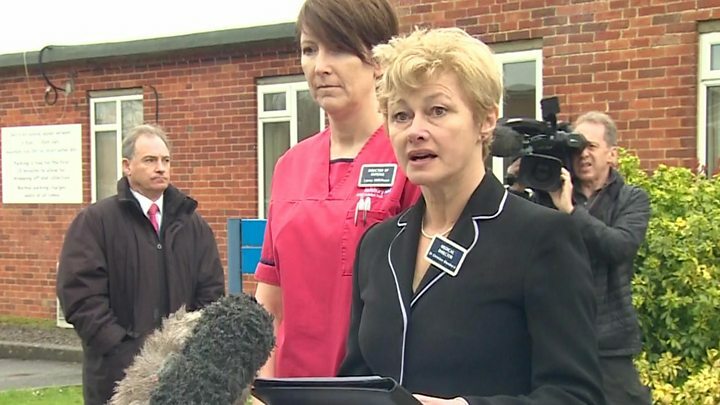 Wiltshire Police Det Sgt Nick Bailey, who attended the scene, was also treated in hospital after being exposed to the nerve agent, but has since been discharged. 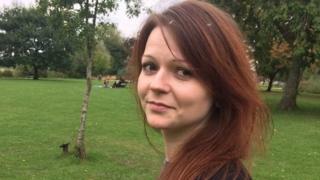 A statement from Ms Skripal released through the Metropolitan Police last week said her "strength is growing daily". Mr Skripal remains at Salisbury District Hospital but is no longer in a critical condition. Medical director Dr Christine Blanshard said he has made "good progress", adding: "Although he's recovering more slowly than Yulia we hope he too will be able to leave hospital in due course." 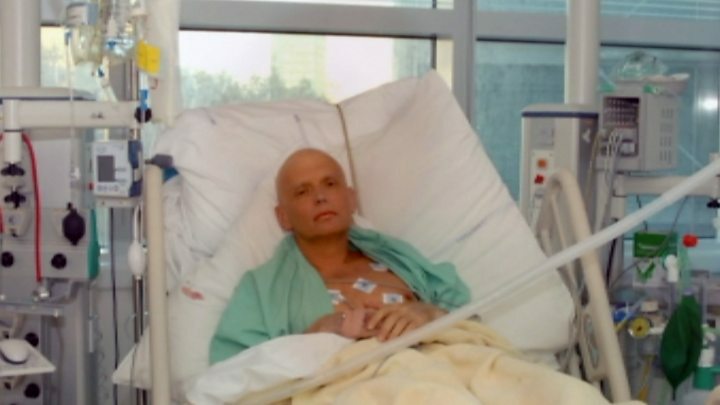 The government says Russia was behind the poisoning, and Prime Minister Theresa May said Moscow was "culpable" for the attack. But the Russian government denied any involvement and has accused the British of inventing a "fake story". According to the BBC's security correspondent Frank Gardner, Whitehall officials have compiled a list of 26 alternative explanations for the attack that have been put forward by Russia's government and media. So far they have attached blame to Ms Skripal's mother-in-law, Theresa May, and a drone, among others. Meanwhile, Mrs May welcomed the news of Ms Skripal's discharge from hospital and wished her the best for her recovery. The Russian Embassy congratulated Ms Skripal but said: "We need urgent proof that what is being done to her is done on her own free will." Responding to a Sunday Times report that the Skripals could relocate and be offered new identities, the embassy said it would view any possible resettlement as an "abduction". On Sunday the Anglican Bishop of Salisbury will host a "service of cleansing and celebration" for the attack victims at St Thomas' Church, less than 200m from where the Skripals were found. It will be followed by a procession near to the bench where they became ill.
Police said the pair first came into contact with the nerve agent at their home. The BBC's health and science correspondent James Gallagher said Novichok prevents enzymes called acetylcholinesterase from functioning normally at nerve junctions, including those required to keep the heart beating. He said: "But over time, the nerve agent is metabolised and excreted by the body and new acetylcholinesterase is made. "The question is whether doctors can keep patients alive long enough for that to happen." BBC security correspondent Gordon Corera said the highest concentration was found on the Skripals' front door handle. Traces of Novichok were also found at the Mill pub and Zizzi restaurant in Salisbury, where the Skripals spent the afternoon. Zizzi, the Mill, the Maltings shopping centre and the Skripals' home remain cordoned off, Wiltshire Police said. Investigators identified 131 people who had potentially been in contact with the nerve agent, and up to 500 people who visited the pub or the restaurant were told to wash their clothes and possessions. Analysis: Will Russia get access to Yulia Skripal? Unseen by the public, Yulia Skripal was discreetly discharged from hospital in Salisbury last night, hours ahead of this morning's announcement. She is understood to have been taken to a secure location somewhere in Britain while discussions take place over her future safety and protection. For the UK government this could prove to be a delicate diplomatic problem. She is a Russian citizen and Moscow has been pressing for consular access. But it is by no means clear where she will want to settle given her narrow escape from death in this failed assassination attempt on her and her father, Sergei. Whitehall officials say reports that the Skripals are to be given a new identity in the US are premature. Samples of the nerve agent have been tested by the Defence Science and Technology Laboratory at Porton Down in Wiltshire, in an attempt to verify its source. Its head said the precise source of the nerve agent had not been verified, but it was likely to have been deployed by a "state actor". A diplomatic crisis between Russia and the West has followed, with more than 20 countries expelling Russian envoys in solidarity with the UK. Russia's request for a new, joint investigation was voted down at the international chemical weapons watchdog at The Hague on 4 April. Mr Skripal is a retired military intelligence officer who was convicted of passing the identities of Russian intelligence agents working undercover in Europe to the UK's Secret Intelligence Service, MI6. He was jailed for 13 years by Russia in 2006, but was released in 2010 as part of an exchange for 10 Russian spies arrested by the FBI. Ms Skripal regularly travelled between the UK and Moscow, and had returned from Russia the day before the pair were poisoned. After Ms Skripal was discharged, her cousin, Viktoria Skripal, told Russian news agency Interfax that Ms Skripal planned to ask for political asylum during a press conference - although she does not know in which country. Viktoria Skripal has been refused a UK visa to visit her relatives. The Home Office said the application did not comply with immigration rules, but a government source told the BBC it appears Russia is "trying to use Viktoria as a pawn".